The Environment Agency is working with its partners to reduce flood risk in Abingdon. The Environment Agency are working in partnership with the Vale of White Horse District Council, Oxfordshire County Council and the Thames Regional Flood and Coastal Committee to find ways to reduce flooding in Abingdon. 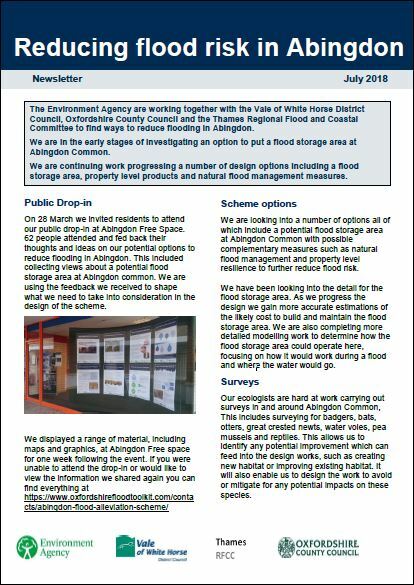 The Environment Agency have been investigating a number of design options including a flood storage area at Abingdon Common, property level products and natural flood management measures. The Rivers Ock, Thames, Stert and the Sandford Brook all contribute to flooding in Abingdon. In July 2007 over 400 residential properties and 20 commercial properties flooded internally. In 2017 the Environment Agency built a flood wall to reduce flood risk to St Helen’s Mill. They have temporary defences available to deploy in Potenger Way, Tower Close, Meadowside and Hermitage Road. They have also carried out modelling and surveying, and ground investigation work. The Environment Agency have been working on the design of a potential flood storage area at Abingdon Common to help reduce flooding in Abingdon. Abingdon Common is to the west of the A34, between Abingdon and Marcham. The Environment Agency have now carried out further ground investigation work, used the latest modelling results and taken on board feedback from the public drop-in earlier in the year. With this combined information they have developed a more detailed design for a flood storage area. Having done this, more detail is now known about the works and materials needed. It was initially thought possible to build the embankment on the existing ground. The results of the surveys have found this would not be possible. Instead it will be necessary to excavate down and build foundations for the embankment. The amount of clay material for the embankment is much more than previously estimated and will have to be brought in. The Environment Agency have also made modifications to the design to ensure the safety of the scheme such as putting in more flow control structures and access routes for maintenance. These safety requirements are important both for staff and public and are in line with the Reservoirs Safety Act 1975. Based on the Environment Agency’s more detailed design information, the estimated cost of the flood storage area would be in the region of £9.7 million. The government and local funding available for the project at the moment is approximately £4 million. To be able to continue with plans to build the flood storage area, the partnership would need to secure the remaining £5.7 million from local partners, businesses and other organisations. For this reason it will not be possible to progress the project design work further until the additional funding can be found. 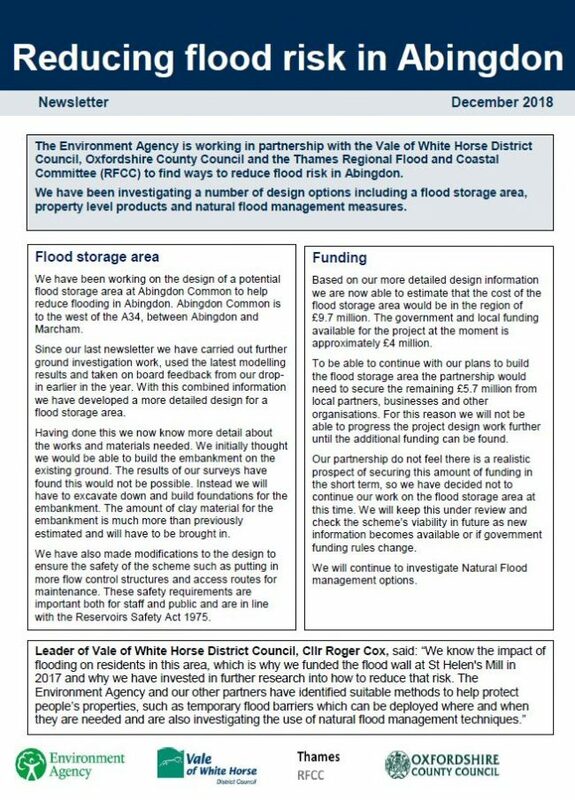 The partnership do not feel there is a realistic prospect of securing this amount of funding in the short term, so the Environment Agency have decided not to continue their work on the flood storage area at this time. They will keep this under review and check the scheme’s viability in future as new information becomes available or if government funding rules change. The Environment Agency will continue to investigate Natural Flood management options. Natural Flood Management measures may be able to help reduce flood risk in Abingdon. Natural Flood Management works by using natural techniques to hold back or slow down water and reduce flooding downstream. 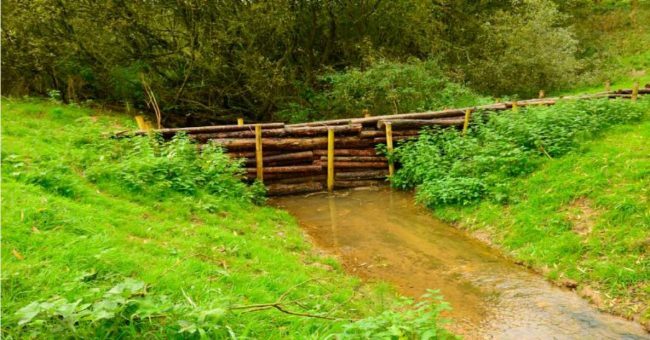 Examples include woody dams, replanting hedges to slow river flow and managing woodland to maintain soil porosity. 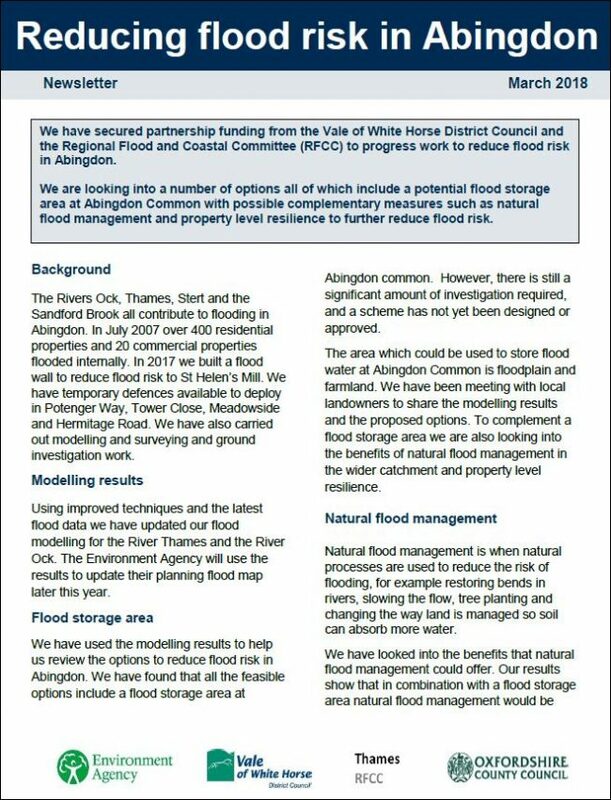 In order to develop the potential Natural Flood Management measures the Environment agency have employed a project manager to look at the opportunities which could benefit Abingdon. The project manager is meeting landowners in potential areas to see what may be possible. The Environment Agency will provide updates with the findings of this work. The Environment Agency have identified three communities in Abingdon where Temporary Flood Barriers could be used to reduce the impact of flooding. These locations are in the Tower Close, Meadowside, Hermitage Road, Healey Close, Potenger Way and Chaunterell Way areas of Abingdon. Temporary Flood Barriers include pumps and barriers that are stored elsewhere and delivered to a location before flooding occurs. Temporary Flood Barriers work by creating an artificial wall to block the flow of water across the floodplain, reducing it from reaching those properties at risk. The Environment Agency are still developing these plans. There is no guarantee that Temporary Flood Barriers can be deployed during every flood because each flood is different and Temporary Flood Barriers do not work in all situations. Continue to develop Natural Flood Management options in the Ock catchment to reduce flooding in Abingdon. Meet landowners to investigate opportunities for natural flood management. 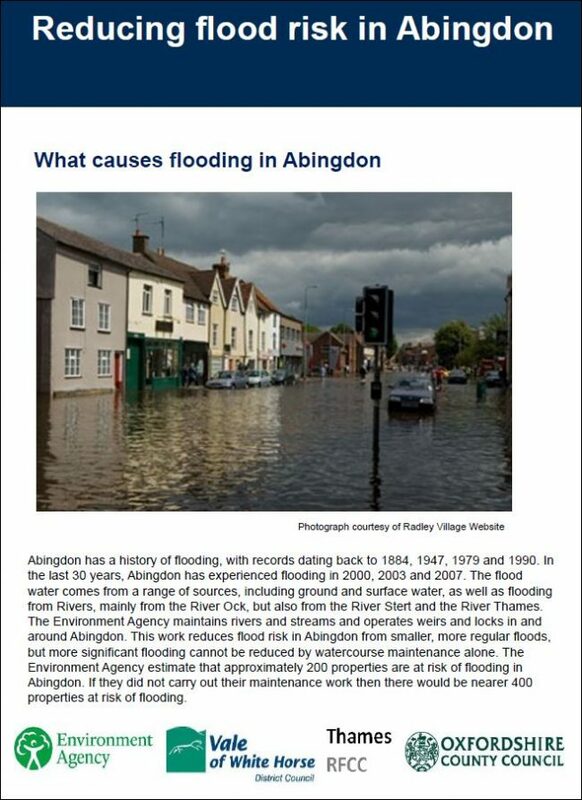 Continue to engage with the community on work to reduce flooding in Abingdon.